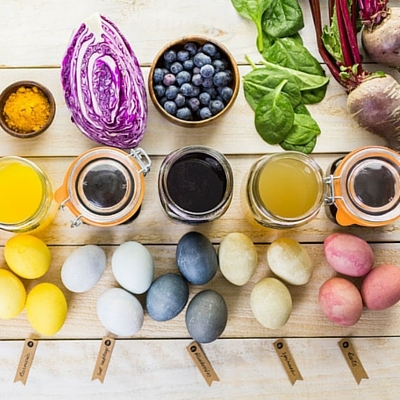 Natural Colors derived from natural food additives such as vegetables, fruit and spices are used to dye the Easter Eggs. There’s no question about it: natural, healthy products are popular. But before charging full-speed toward clean-label foods, keep in mind how the natural kick will impact your final product. For example, what about natural food additives? What counts and what doesn’t? What do you need to know before incorporating them into your recipes? Are they worth the switch? Two key additives in the food industry are colors and flavors. Both play a big part in making food appealing and keep up the appearances consumers expect. Keep reading to learn more about their natural substitutes. Natural colors are derived from a natural source: plants, seeds, minerals, etc., and used to dye and color foods and beverages. The natural source could be a fruit juice, or a spice such as turmeric. While these have a more natural origin than synthetically made colors, they are not as colorful and may influence your final product’s taste or consistency. And pay attention when you use natural colors, because they are very sensitive to heat and pH. Natural flavors are also typically derived from plant or mineral sources. However, they are more consistent and are used much more often than natural colors. In fact, natural flavors are just as common in food as artificial ones are. Often, natural flavors have a much more complex ingredient list than artificial ones do, to ensure they are reliable and properly preserved. And that’s just the surface! Find out about the production process for natural colors and flavors, and how the FDA regulates them on BAKERpedia.